Figure 3-3. A, Classic mammographic appearance of infiltrating ductal carcinoma demonstrating irregular, spiculated margins. B, Sonographic visualization of the same infiltrating ductal carcinoma illustrating a hypoechogenic mass with irregular margins. Figure 3-4. A, Mammographic spot view of a 0.8 cm infiltrating ductal carcinoma with microlobulated and partially ill-defined margins. B, Sonographic image of the same infiltrating ductal carcinoma demonstrating the marked irregularity of the tumor margins (arrows), despite the small size. cinoma, however, can mimic a benign lesion with partially circumscribed margins (Figure 3-4). Figure 3-5. A, The arrow identifies a vague, developing asymmetric density on this spot compression view. 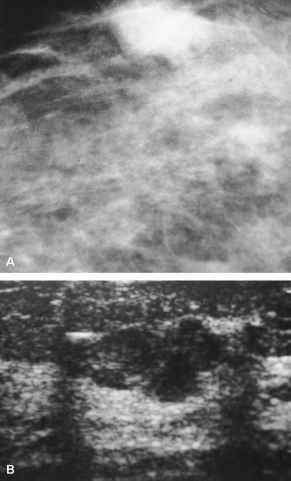 B, Despite the subtle mammographic appearance, the ultrasound image clearly visualizes this infiltrating lobular carcinoma revealing the markedly jagged margins. intracystic mass or intraductal lesion depicted by sonography raises concern for a papillary neoplasm (Figure 3-8). Figure 3-6. A, Mammographic image of a 6 cm circumscribed medullary carcinoma. B, Ultrasound reveals the heterogeneous hypoechoic nature of this medullary carcinoma. raphy, indistinguishable from infiltrating ductal carcinoma (Figure 3-9). Tubular carcinoma can be confused or associated with a radial scar (sclerosing papillomatosis), a benign entity (Figure 3-10). Figure 3-7. A, This partially circumscribed mammographic nodule represents a colloid (mucinous) carcinoma. B, The heterogeneous hypoechoic and lobulated appearance of this colloid carcinoma is easily visualized with ultrasound. Figure 3-8. A, Papillary carcinoma with the typical appearance of a partially circumscribed mass. 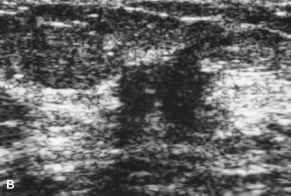 B, Sonographic image of the same papillary neoplasm reveals the intracystic mass (arrow). phyllodes tumors are malignant. This tumor can present as a rapidly growing palpable mass. Breast imaging usually shows a large rounded or lobulated circumscribed mass. Cystic spaces can be seen by sonography (Figure 3-11). 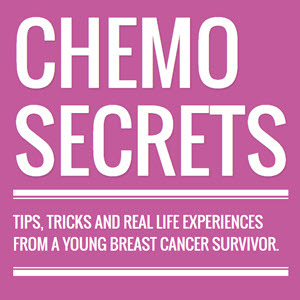 Metastasis to the breast, although uncommon, can occur from a variety of primary malignancies, including melanoma, lymphoma, lung cancer, and contralateral breast carcinoma. Mammographically, the metastatic lesions tend to be round and lack spiculations (Figure 3-12).